Because no one wants a noisy houseguest that puts holes in the sheets, at Flatliners Pest Control, we’re here to help you with cricket pest control in Las Vegas. They skitter, they hop, and man are they loud. These little nuisances seem to pop in uninvited and overstay their welcome pretty quickly. There’s no reason to worry about crickets in your home when you put our high-quality extermination services to the test. Of the hundreds of species of crickets, only a few are commonly seen in Nevada. These insects are closely related to grasshoppers and locusts. They are yellow to tan or brown in color in our local area. The Mormon cricket can grow up to two inches long which can be a little bit frightening to those squeamish around insects. Mole crickets are also known to be lawn pests. 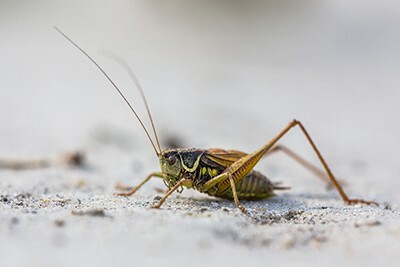 Although crickets usually live outside, they can quickly move from unexpected visitor to a full-on cricket infestation if your home provides ideal nesting conditions. They may breed and become an excellent source of food attracting other, larger pests or die off and cause unpleasant odors in your home as they decay. These are just a few reasons to take action with professional cricket removal before they become a bigger problem. A pest doesn’t always have to bite to be a problem. Our cricket control services help to protect you from unintentional scares, ruined draperies, intolerable noise and the many other inconveniences these little menaces cause homeowners. Whether you’ve seen one creepy crawly or are dealing with a whole cricket infestation, our experienced technicians can help you. Don’t let the late night love songs of this home intruder loose you one more night of sleep. Hire the best cricket exterminator in Las Vegas when you call us at Flatliners Pest Control today. We are here to make sure your property stays free of pests both indoors and outdoors. We look forward to finding out how our pet and family-safe, professional services can help you.